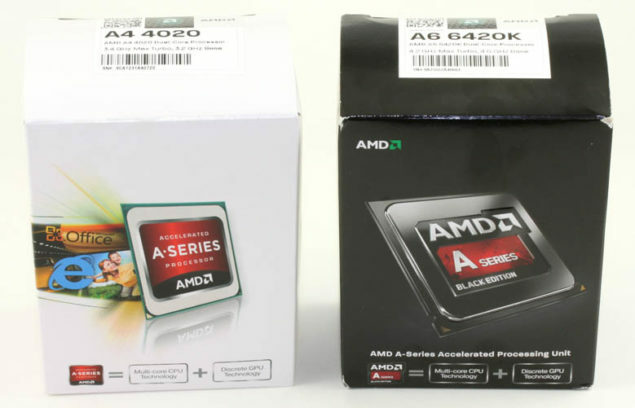 AMD has secretly released 3 SKUs targeted at the lower spectrum of the APU market. More specifically the vacuum left by the Kaveri Dual Cores which are coming out sometime in the second quarter of 2014. All of the SKUs have 65 Watt TDP and should be available in US Retailers very soon. There is, as of yet, no word on pricing but should be less than the $150 mark. As you would know, Kaveri APU was released some time ago. However all SKUs currently available (or very recently anyways) consisted of APUs with 4 Cores and a price point of $150 and above. There was a vacuum left by the absence of Kaveri APUs with 2 Cores and it is this vacuum that AMD has filled by rolling out 3 APUs from the A4 and A6 series of Accelerated Processing Units. Do note that there are already preceeding models of these SKUs so this is more like a refresh. The APUs released, namely the A4-4020, A4-6320 and A6-6420K all have 2 Cores, 65 Watt TDP and 1MB of L2 Cache. All SKUs contain the Piledriver instruction set including AES, FMA and AVX. The A4-4020 will succeed the A4-4020 and will be clocked 200Mhz above its predecessor (Base and Boost) . The A4-2020 will have DDR3-1333 memory with the 7480D. The A6-6320 will succeed the A4-6300 and will be clocked 100Mhzabove its predecessor (Base and Boost). The A4-6320 will have DDR3-1600 memory with the 8370D. The A6-6420K is a black series APU so will be overclockable. Compared to the 6400K it will be clocked 100Mhz higher. It will have the DDR3-1866 Memory with 8470D.